Proof created a comprehensive earned and digital media strategy to launch a public education campaign, educating Bay Area consumers of the dangers of improper battery disposal and safe recycling practices. Rechargeable battery use is on the rise: 95% of Americans own a cellphone and almost 50% own e-readers or tablets. Lithium ion batteries, which power laptops, cellphones and cordless power tools, retain a residual charge even when they appear “dead.” These batteries can spark and catch fire if not disposed of correctly. Call2Recycle is dedicated to teaching the public the safest way to dispose of rechargeable (lithium ion) and single-use batteries. 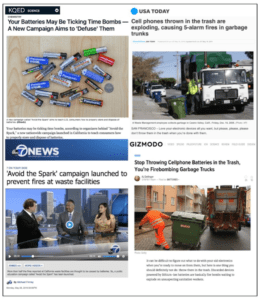 We created a comprehensive earned and digital media strategy to launch phase one of Call2Recycle’s public education campaign: Avoid the Spark, Be Battery Safety Smart, educating Bay Area consumers of the dangers of improper disposal and safe recycling practices. The timely campaign kicked-off at the start of California fire season with behind the scenes tours for media and influencers to see safe practices and the spark first-hand at the household waste and recycling facilities in the Bay Area. Proof secured local and national news coverage on safe battery recycling practices, including USA Today, CBS Radio, KGO-TV 7 (the San Francisco ABC affiliate), Gizmodo and much more: 24 earned media placements and 10 radio interviews. Ultimately, including reprints, Call2Recycle received more than 177 online, print, radio and television mentions in a two week period, reaching more than an estimated 196 million people. We also activated a dynamic, real time social media campaign to promote tours and press coverage which generated more than 78,000 impressions on Twitter, Facebook and LinkedIn.